The extra point play is often overlooked as the most mundane and routine play in football. After a series of extraordinary plays Saturday afternoon at Chet Anderson Stadium, that routine play brought Bemidji State to its knees. Defending national champion Minnesota-Duluth escaped with a 35-34 victory over Bemidji State when Jesse Sundby’s extra point kick missed wide left at the end of regulation. It missed after Bemidji State’s Jody Henningson pulled down a 32-yard Hail-Mary pass in the end zone as time expired in the fourth quarter. The loss essentially eliminates the Beavers (6-3 overall, 5-3 NSIC) from landing a postseason berth in the Division II national tournament at the end of the season, although slim possibilities remain. No. 7 ranked Minnesota-Duluth (8-1, 8-0 NSIC) remained tied atop the conference standings with the win. The Bulldogs have not lost a NSIC game since joining the league last season and are 23-1 overall since then. 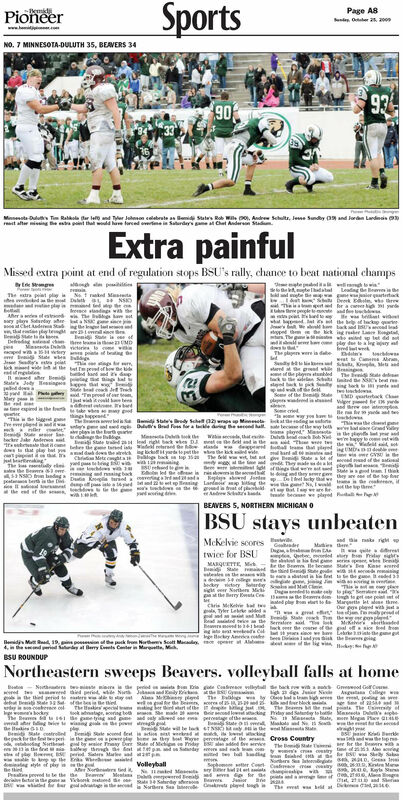 Bemidji State is one of three teams in those 23 UMD victories to come within seven points of beating the Bulldogs. The Beavers never led in Saturday’s game and used explosive plays in the fourth quarter to challenge the Bulldogs. Bemidji State trailed 28-14 before the game turned into a mad dash down the stretch. Christian Metz caught a 10-yard pass to bring BSU within one touchdown with 3:40 remaining and running back Dustin Kroeplin turned a dump-off pass into a 56-yard touchdown to tie the game with 1:40 left. Minnesota-Duluth took the lead right back when D.J. Winfield returned the following kickoff 84 yards to put the Bulldogs back on top 35-28 with 1:20 remaining. BSU refused to give in. Edholm led the offense in converting a 3rd and 20 and a 1st and 22 to set up Henningson’s touchdown on the 60-yard scoring drive. Within seconds, that excitement on the field and in the stands disappeared when the kick sailed wide. The field was wet, but not overly soggy, at the time and there were intermittent light rain showers in the second half. Replays showed Jordan Lardinois’ snap hitting the ground in front of placeholder Andrew Schultz’s hands. The players were in disbelief. Sundby fell to his knees and stared at the ground while some of the players stumbled back to the sideline. Schultz stayed back to pick Sundby up and walk off the field. Some of the Bemidji State players wandered in stunned silence. Click to enlarge this panoramic-style photo I shot to serve as the main photo to run with this story. Leading the Beavers in the game was junior quarterback Derek Edholm, who threw for a career-high 391 yards and five touchdowns. He was brilliant without the help of backup quarterback and BSU’s second leading rusher Lance Rongstad, who suited up but did not play due to a leg injury suffered last week. Ehdolm’s touchdowns went to Cameron Abram, Schultz, Kroeplin, Metz and Henningson. The Bemidji State defense limited the NSIC’s best running back to 101 yards and two touchdowns. UMD quarterback Chase Volger passed for 136 yards and threw one interception. He ran for 99 yards and two touchdowns. Minnesota-Duluth dictated play early and scored first on Odim’s 11-yard rush through the middle of the field at 4:05 of the first quarter. Vogler gave the Bulldogs a 14-0 lead midway through the second quarter when he scrambled untouched into the end zone on a seven-yard run. Bemidji State then broke free of the slow start. On the possession following Vogler’s touchdown, Schultz broke a tackle on the sideline on the 32-yard touchdown reception to cut UMD’s lead to 14-7 with 2:31 left in the half. But the Bulldogs answered by taking advantage of Odim’s 39-yard kick return and capped a six-play scoring drive on Vogler’s 14-yard run. That score gave the Bulldogs a 21-7 advantage with 1:14 left in the second quarter. Bemidji State felt a sense of urgency at that point and started to play with desperation. Abram came through for the Beavers on the first play of the following possession by outrunning the secondary on a deep pass for a 64-yard touchdown reception. The score with 1:00 to go was the final touchdown of the half and brought Bemidji State within 21-14, although Bemidji State was given another chance when Dusty Sluzewicz intercepted Vogler with 23 seconds left near midfield. Bemidji State was able to run three plays before Edholm was sacked to end the half. The Bulldogs started with the ball in the second half and scored the lone touchdown of the third quarter on a methodical 12 play, 67-yard drive that ended with Odim punching through the line on a 3-yard touchdown run. Bemidji State was able to move the ball on the following possession and Brian Leonhardt nearly came close to pulling in a highlight-reel catch at the goal line. Blanketed by the coverage of UMD’s Brandon Wood, the ball tipped in and out of his hands on the third down play that nearly resulted in a 26-yard touchdown. BSU tried to go for Leonhardt again on fourth down, but UMD covered the goal line and Edholm overthrew the end zone to avoid an interception. Bemidji State’s defense played exceptional in the second half, keeping the game close when the Bulldogs threatened to run away with it. The Beavers were treated to a heavy dose of Odim, but the holes that existed in the first half disappeared in the first quarter. Duluth was unable to find the first downs to close out the Beavers. Metz’s touchdown came at a do-or-die time for the Beavers and the reception started the fireworks in the final minutes. Edholm threw over the middle of the field to Metz, who tipped the ball out of the linebacker’s hands and caught it while falling backwards across the goal line with 3:14 to play. The BSU defense came up big by forcing the UMD offense off the field in a threeand-out and at that point in the game, the Beavers had all of the momentum. Kroeplin was able to tie it for the Beavers when he found a gap in the coverage. He took a short pass and turned it into a 56-yard touchdown reception with 1:40 left to bring the score to 28-28. The Bulldogs then pulled out a big play of their own when Winfield returned the ensuing kickoff 84 yards. Bemidji State’s offense had solved the Bulldog defense in the second half and was left with 1:23 on the clock to drive for the tying touchdown. BSU was able to accomplish that in seven plays when Henningson jumped above three Bulldog defenders to pull down the pass. Tesch explained his reasoning for not going for a two-point conversion after Henningson’s touchdown. Tesch said it is “unfortunate” that Sundby will take blame for the loss. Sundby’s punts played a big role in keeping the game close in the second half in the field position battle. He averaged 36 yards on six punts in the game.